Vancouver-based Semios, a provider of agricultural precision pest management technology, has received approvals from both the Environmental Protection Agency (EPA) and the California Department of Pest Regulation (DPR) for their aerosol pheromone biopesticide products aimed at disrupting the mating habits of the Navel Orangeworm. 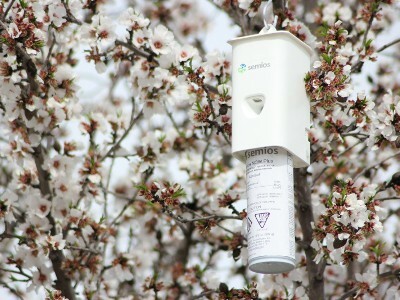 The patented Semios platform monitors the quantity of pests, along with flight strength, wind patterns and temperature to optimize pheromone deployment in the field, all through a single interface that a farmer can easily control. Pheromones are a naturally occurring means of communication between insects, and are species-specific, making them targeted towards the pest that’s bothering the crop while also causing no damage to the insect itself. Male insects, confused by the pheromone interference, are no longer able to locate a mating partner and end up drifting off to another field. Other insects, such as pollinators and beneficial species are not affected by the pheromones because they’re specific to the targeted species. The approval means that Semios NOW Plus and Semios NOW Standard (for organic growers) are available for orchards growing walnuts, pistachios, almonds, dates, figs, citrus, pome and stone fruits. The Navel Orangeworm is especially destructive towards introduced nut crops like these. Semios founder and CEO Michael Gilbert has two decades of experience as a chemist, working at Merck and Cardiome Pharma Corp., where he managed R&D for cardiovascular medications and specialized on manufacturing pharmaceutical products based on naturally occurring substances. In a two-year pilot project on an apple orchard in Oliver, B.C., Semios saw the population of apple clearwing moths drop from 200 per acre to five. Last May, Semios added a Frost Module to its platform, in addition to its Pest Management, Disease Control and Irrigation Management modules.